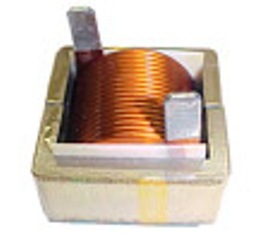 The CWS' ShoeBox Inductor Series of Very High Current Choke / Very High Power Inductor handles up to 1000 Amperes and are designed using multiple copper foils winding to achieve lower DC resistance (DCR), lower AC resistance (skin effect loss), and high inductance. The core materials used are stacked E-shaped Distributed Air Gaps Compacted E-Cores from Micrometal. The design is similar to the HCS Series. Both Gapped and UnGapped cores are used to extend the DC bias capability. The Standard Product page shows data sheets in PDF for the 300 Amperes version. Please click on the link to go to CWS standard product page. But for custom design, the current rating could be up to 1000 Amps. The Standard off the shelf HCS Series of Very High Power Inductor / Very High Current Inductor are capable of handling high DC bias current up to 300 Amps, high energy storage and high voltage swing due to higher mass and higher saturation flux densities of the cores used. 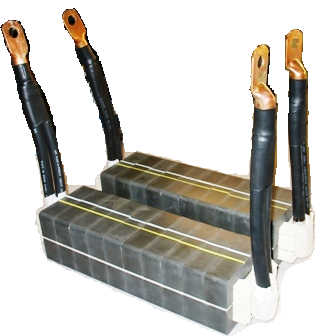 The standard product HCS Series and the custom Shoe Box Inductor Series are constructed using Iron Powder, Silicon Iron or Sendust cores and are suitable for swinging chokes, energy storage filter inductor in SMPS with high ripple current, in-line noise filters with large AC voltage swing, unidirectional drive application such as pulse transformer and flyback transformer. The HCS Series and the Custom ShoeBox Inductor are using stacked E-Cores based on Micrometals's #26 materials (Iron Powder), Micrometal's Super-MSS (Sendust) and Micrometal's FluxSan (Silicon Iron). 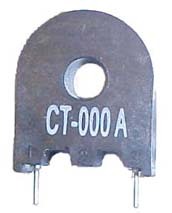 The Silicon Iron version is suitable for those application requiring small inductance drop when a high DC current (DC bias) is flowing into the inductor. The Sendust version is suitable for energy storage inductors. The Iron Powder version is suitable for Output Ripple filtering, High Power Output Chokes and High Current Inductor where a good DC bias characteristics is desired. The core loss of the Sendust and Silicon Iron are very similar at frequency below 300 Khz. Silicon Iron version cost a little more than the others. The Silicon Iron cores are not suitable for application over 750 Khz, and has a much higher core loss than the Sendust cores. From our Standard Product page, you can download the PDF drawing which shows the DC Bias Current versus Inductance table. It is not necessary that inductor with higher Inductance versus DC Bias Current is better in all cases. This is because Energy Storage in a filter is defined as 1/2 x [L] x [Sq I], where [L] is the inductance and [Sq I] is the square of the current flowing into the inductor. For energy storage filtering application, having a good DC bias is not always a desired feature. When the current flow into the inductor increases, the amount of energy stored increased to the square of the current [Sq I], and if the inductance [L] does not drop when the current increase, the energy stored maybe too high and could potentially cause a circuit to blow up. For such energy storage filtering application such as Input Filter ( Phi or butterworth or chebyshev filters), or the Boost Inductor, the HCS Series using Sendust is usually the desired choice. However, every application is different and the design engineer must balance the trade offs.